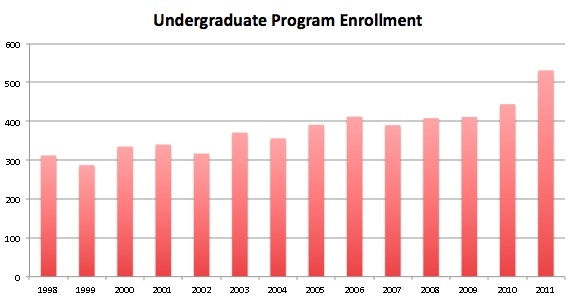 Gainesville: The College of Engineer released its official enrollments for the Fall, 2011 semester. The Department of Industrial and Systems Engineering has 531 students enrolled in the undergraduate program, only trailing Mechanical Engineering (1094 students), Chemical Engineering (588) and Civil Engineering (574) as the most popular in the College. (There are 19 different majors in the College.) This is the fourth straight year in which the program has grown. It is up nearly 20% from last year and over 50% from a decade ago. 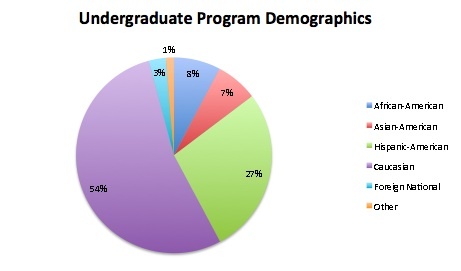 The demographics of the undergraduate student body are given in the accompanying chart. Female students comprise 35% of the student body, with 65% being male. The female population has grown over 20% since last year, as has the Hispanic-American population in the Department. There are a total of 15 Foreign-National students in the program.